LANGKAWI: Shipping tycoon Tan Sri Halim Mohammad, founder and executive chairman of formerly listed Halim Mazmin Bhd, yesterday launched a new charter airline, making Langkawi, Kedah its base of operations. “The new airline offers point-to-point travelling for passengers to get to destinations that are deemed uneconomical or unsuitable for commercial flights to land,” he told reporters at the launch of the new airline and the groundbreaking ceremony for the development of a water theme park by Langkawi International Sdn Bhd here yesterday. For starters, the new airline will fly from Langkawi to Penang, Alor Setar, Ipoh, Pangkor, Subang, and also destinations in South Thailand, including Hatyai, Krabi and Phuket. 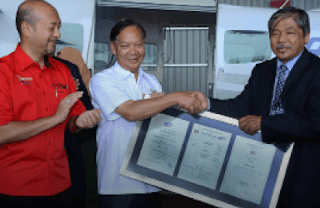 Eventually, Halim said he plans to convert the Cessna turboprop into an amphibian aircraft so that it can also land on water. Halim said there is no target set for the airline to break even although he expects Prima Air to operate a fleet of three to four aircraft within two years. On the development of the water theme park, he said the Halim Mazmin Group is allocating RM60 million for phase 1 of Langkawi Water Kingdom, which spans 10 acres (4.05ha) in Langkawi’s main town of Kuah. “We are thankful to Unit Peneraju Agenda Bumiputera (Teraju), which had agreed to part-finance the required infrastructure works,” he added. The proposed theme park will feature eight types of family rides and others. The rides are designed by Polin Waterparks of Turkey. Construction on the proposed theme park has started and will be completed in 18 months.